The number of sales increased from 2004 - 2006, mirroring the growth in inventory. From 2007 - 2009 sales decreased by 46%. In spite of decreasing inventory, from 2010 - 2014 sales have increased. As in Cambridge, this is an indication that demand for condos remain strong. Mirroring Cambridge, the number of days on market increased significantly from 2005 - 2007 peaking at an average of 110 days. As inventory has decreased days on market has steadily decreased reaching a low of 34 days in 2014. Sale prices relative to list prices have remained in the 97 - 100% range from 2004 - 2013. As inventory decreased dramatically in 2013 and into 2014 many condo listings attracted multiple and over asking price offers. This has driven the sale to list price ratio up to 103% in 2014. The number of units on the market from 2005 - 2008 was inflated by many multifamily to condo conversion projects. Once these projects sold out development activity greatly slowed leading to a significant reduction in inventory. 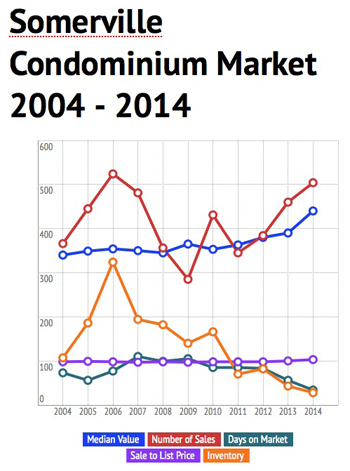 The number of condo units on the market on May 20, 2014 was down an amazing <b>91.36%</b> from May 20, 2006. The Somerville condominium market trends are nearly identical to Cambridge. However, the market is strongest in neighborhoods closest to Cambridge and the Red Line subway stops of Davis and Porter Squares. Condos that are further than a 15 minute walk to the Red Line are receiving fewer offers and are staying on the market longer. Values are in thousands. All data from MLS PIN.